Guilá Naquitz Cave in Oaxaca, Mexico is the site of early domestication of several food crops, including teosinte (an ancestor of maize), squash from the genus Cucurbita, bottle gourds (Lagenaria siceraria), and beans. This site is the location of the earliest known evidence for domestication of any crop on the continent, Cucurbita pepo, as well as the earliest known domestication of maize. Macrofossil evidence for both crops is present in the cave. However, in the case of maize, pollen studies and geographical distribution of modern maize suggests that maize was domesticated in another region of Mexico. The cave is 5 km (3.1 mi) northwest of Mitla at the base of a cliff that rises 300 m (980 ft) above a semiarid valley floor at an elevation of 1,926 m (6,319 ft). There are five strata as deep as 140 cm (55 in). The entrance to the cave is 8 by 10 metres (26 by 33 ft). It is at the very eastern end of the Oaxaca Valley. While the earliest human evidence in Guilá Naquitz Cave dates to about 10,750 years BP, inhabitation was not continual and was not year-long. Humans ceased living in the cave about 500 BP. Humans lived in the cave six separate timeframes from about 10,750 to 8,900 years BP and again from about 1,300 to 500 years BP. The earlier inhabitants were pre-ceramic hunter-gatherers who lived in the cave only from August to October–December. The earliest known evidence of the domestication of Cucurbita, which is native to the Americas, dates back 8,000–10,750 years BP, predating the domestication of other crops such as maize and beans in the region by about 4,000 years. This evidence was found in the Guilá Naquitz Cave and four other Mexican caves during a series of excavations in the 1960s, possibly beginning in 1959. Further excavations at the Guilá Naquitz site were carried out in the 1970s by a team led by Kent V. Flannery from the University of Michigan. Subsequent more accurate dating using accelerator mass spectrometers provided more specific dates. Solid evidence of domesticated C. pepo was found in the Guilá Naquitz Cave in the form of increasing rind thickness and larger peduncles in the newer stratification layers of the cave. By circa 8,000 years BP the C. pepo peduncles found are consistently more than 10 mm (0.39 in) thick. Wild Cucurbita peduncles are always below this 10 mm (0.39 in) barrier. Changes in fruit shape and color indicate intentional breeding of C. pepo occurred by no later than 8,000 years BP. During the same time frame, average rind thickness increased from 0.84 mm (0.033 in) to 1.15 mm (0.045 in). The process to develop the agricultural knowledge of crop domestication took place over 5,000–6,500 years in Mesoamerica. Squash was domesticated first, with maize second and then beans being domesticated, becoming part of the Three Sisters agricultural system of companion planting. ^ a b Benz, Bruce F. (2005). "Archaeological evidence of teosinte domestication from Guilá Naquitz, Oaxaca". Proceedings of the National Academy of Sciences. National Academy of Sciences of the United States of America. 98 (4): 2104–2106. doi:10.1073/pnas.98.4.2104. JSTOR 3055008. PMC 29389. PMID 11172083. ^ a b c Smith, Bruce D. (May 1997). "The Initial Domestication of Cucurbita pepo in the Americas 10,000 Years Ago". Science. Washington, DC: American Association for the Advancement of Science. 276: 932–934. doi:10.1126/science.276.5314.932. ^ a b "Cucurbitaceae--Fruits for Peons, Pilgrims, and Pharaohs". University of California at Los Angeles. Archived from the original on October 16, 2013. Retrieved September 2, 2013. ^ a b Feinman, Gary M.; Manzanilla, Linda (2000). Cultural Evolution: Contemporary Viewpoints. New York: Kluwer Academic. pp. 20–25, 31. ISBN 0-306-46240-0. ^ Harrington, Spencer P. M. (1997). "Earliest Agriculture in the New World". Archaeology. Archaeological Institute of America. 50 (4). Retrieved September 26, 2013. ^ "Prehistoric Caves of Yagul and Mitla in the Central Valley of Oaxaca". UNESCO. Retrieved September 25, 2013. ^ a b c Piperno, D. R.; Flannery, K. V. (February 2001). "The Earliest Archaeological Maize (Zea mays L.) from Highland Mexico: New Accelerator Mass Spectrometry Dates and Their Implications". Proceedings of the National Academy of Sciences of the United States of America. National Academy of Sciences of the United States of America. 98 (4): 2101–2103. doi:10.1073/PNAS.98.4.2101. JSTOR 3055007. PMC 29388. PMID 11172082. ^ a b Schoenwetter, James (April 1974). "Pollen Records of Guila Naquitz Cave". American Antiquity. Society for American Archaeology. 39 (2): 292–303. doi:10.2307/279589. JSTOR 279589. ^ Smith, Bruce D. (2000). Guilá Naquitz Revisited. New York: Kluwer Academic. pp. 15–60. doi:10.1007/978-1-4615-4173-8_2. ISBN 978-1-4613-6871-7. ^ a b Whitaker, Thomas W.; Cutler, Hugh C. (1971). "Pre-Historic Cucurbits from the Valley of Oaxaca". Economic Botany. New York Botanical Garden Press. 25 (2): 123–127. doi:10.1007/bf02860073. JSTOR 4253237. ^ Landon, Amanda J. (2008). "The "How" of the Three Sisters: The Origins of Agriculture in Mesoamerica and the Human Niche". Nebraska Anthropologist. Lincoln, NE: University of Nebraska-Lincoln: 110–124. ^ Bushnell, G. H. S. (1976). 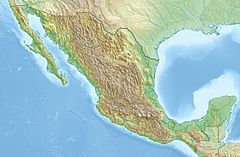 "The Beginning and Growth of Agriculture in Mexico". Philosophical Transactions of the Royal Society of London. London: Royal Society of London. 275 (936): 117–120. doi:10.1098/rstb.1976.0074. This page was last edited on 16 February 2018, at 15:48 (UTC).